These findings can potentially be used in developing efficient and environmentally-conscious coagulants for water treatment. The findings were presented on May 29, 2016 at the 76th Japan Society for Analytical Chemistry Symposium. In order to provide clear, safe tap water it is necessary to remove particles called colloids from raw water. These particles are very small, between nanometer order and micrometer order in diameter. Polychlorinated aluminum is used as a coagulant in the water treatment process to collect and dispose of these particles. However, aluminum ions can be toxic for fish and inhibit plant growth. The Japanese Water Works Law specifies that aluminum concentration in water must be limited to below 0.1ppm (1:10,000,000). Various hydrolyzed species of aluminum ion can be detected in water. Until now the “ferron method”, involving pigments and absorption meters, has been widely used to calculate the concentration of these compounds. However, this method has some disadvantages: the analysis takes several hours and the results often contain errors. 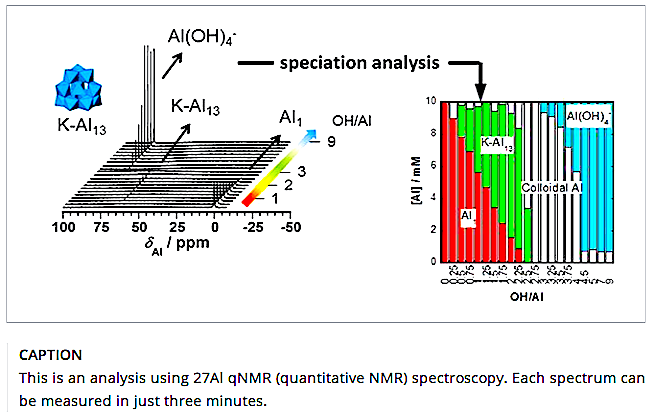 Associate Professor Maki’s research group optimized NMR equipment to develop an analysis method called “27 Al qNMR (quantitative NMR) spectroscopy” that accurately measures the abundance of each aluminum compound. Notably, measurements using this analysis method can be carried out in just three minutes, and the concentration of hydrolyzed species can be calculated to within a very small margin of error in all pH ranges. After the agglomeration mechanism of sludge including the aluminum ion was analyzed, the group discovered that when there is a high concentration of aluminum ions, after roughly 100 minutes a Keggin-type tridecameric cluster (K-Al13 ) is formed, and after a few months polymerization occurs. As well as making it easier to measure the concentration of aluminum ions in water, this new analysis method has also clarified the structural changes aluminum ions undergo over time. These findings could potentially contribute to the development of high-performance, environmentally-conscious coagulants that can act more efficiently on colloids.